The October Bank Holiday weekend is your last chance to let your hair down and have a weekend away before the winter sets in. 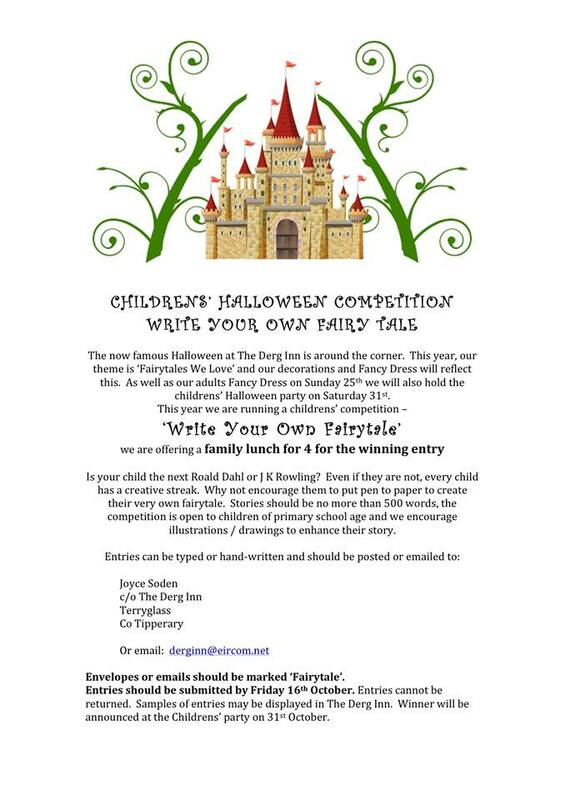 The Derg Inn Terryglass holds its annual Fancy Dress night on Sunday October 25th and the theme this year is ‘Fairy Tales We Love’ Each year people arrive to this wearing the most wonderful creations and customer and we are sure that this year will be do different. However, this year the children will have the own opportunity to shine as there will be a children’s party held on the traditional Halloween evening, Saturday the 31st of October, when they all go ‘trick or treating’ around the locality. 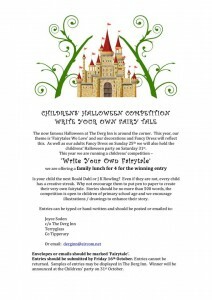 In advance of the children’s party there is an opportunity for your young emerging writers to submit an original fairy tale of their own as The Derg are running a childrens’ competition – ‘Write Your Own Fairytale’ and are offering a family lunch for 4 for the winning entry. Is your child the next Roald Dahl or J K Rowling? Even if they are not, every child has a creative streak. Why not encourage them to put pen to paper to create their very own fairytale. Stories should be no more than 500 words, the competition is open to children of primary school age and we encourage illustrations / drawings to enhance their story. Entries should be submitted by Friday 16th October. Envelopes or emails should be marked ‘Fairytale’. Entries cannot be returned. Winner will be announced at the Childrens’ party on 31st October.